There are some great frameworks to evaluate the diffusion of new innovations, but these tend to be qualitative and can therefore be difficult to evaluate multiple nuanced implementations against one another. Here is a “back of the envelope” quantitative approach to assessing whether a new solution might displace an incumbent one, when competing on “convenience”. Increasingly new products are introduced as radically simpler options to an incumbent. When competing on this convenience-based value proposition, in order to gain initial adoption the user must be able to perceive (or expect) that the switching effort to the new solution will be worth it to them. Let’s take a deeper look at each side of this “equation”. Then plot the incremental effort of each trial, E(incremental). Here, I’m assuming since each use is independent the incremental effort is consistent each time, and therefore a flat line. E(incremental) is assumed to be much less than the incumbent solution (or else why would you introduce it?). 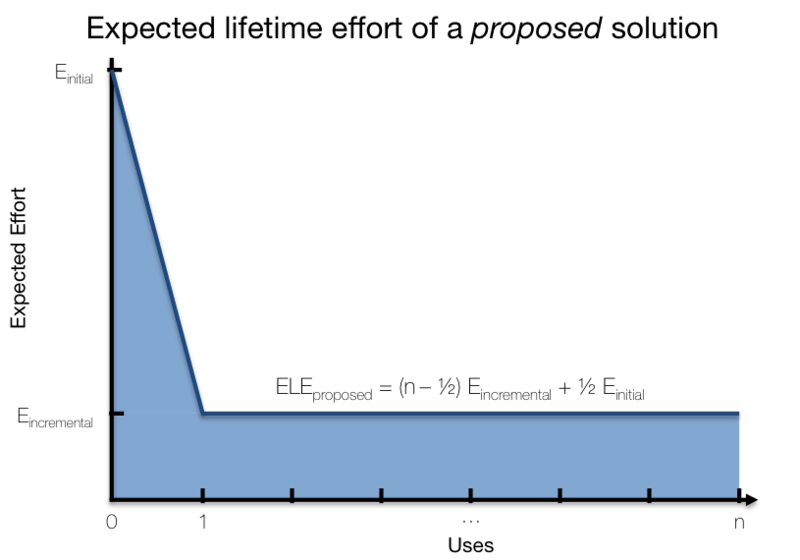 As with the incumbent, we assume each trial as independent, so therefore plot a flat line. With these formulae, the next step is to quantify each term. 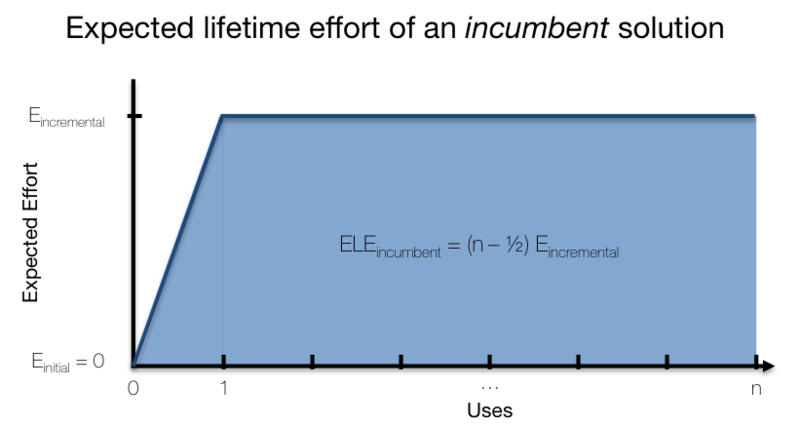 To do so, we’ll want to ensure that we’re trying to measure things with consistent units, so here are some rules of thumb for determining the values of E(incremental) and E(initial). Start by enumerating the discrete number of steps in the process. For example, imagine you had an onboarding flow 5 form fields (first name, last name, email address, password, and credit card number) that comprise your E(initial) value. For each step in the process assign a “multiplier” based on the difficulty for the user. It doesn’t truly matter your units, once they are consistent across the left and right-hand side. For this, I like to use a Fibonacci set, similar to the method used for assigning story points in an agile process. With the values plugged into each side, both ELE(proposed) and ELE(incumbent) can be evaluated. Keep in mind that this model purely focuses on the “costs” to the user, and not benefits, but assuming those are equal we have a method to both analyze the likelihood a new technology, or solution, has at displacing an incumbent, and also help design the new solution, and see how shifting effort from upfront to incremental makes a difference (and vice versa).